The Gajner Palace in Bikaner was built on the banks of Gajner Lake by HH Maharaja Sir Ganga Singh of Bikaner who was one of the greatest Maharajas of Bikaner, in the early decades of the twentieth century. The Palace has a private wildlife sanctuary, which has been made recently and the sanctuary is being a home to some rare breeds of antelopes like the chinkara, black buck, neelgai and other animals. During the winter months, the lake becomes home to more than a hundred species of migratory birds, including the Imperial Sand Grouse. The Palace has been turned into a heritage hotel with exclusive sophisticated hospitality and the greenery. In the vicinity of Gajner Palace, of Bikaner the beauty spreads along with its splendid lawns, the fascinating twittering of birds, the leisurely walk of peacocks all play their roles in making it a treasured destination for tourists. Gajner Palace is a treat to your eyes as far as exclusive royal architecture is concerned and if you want to stay in this place you will again be treated as a royal guest with its authentic Rajasthan style hospitality.Gajner Palace is located at just 30 km distance from Bikaner city. 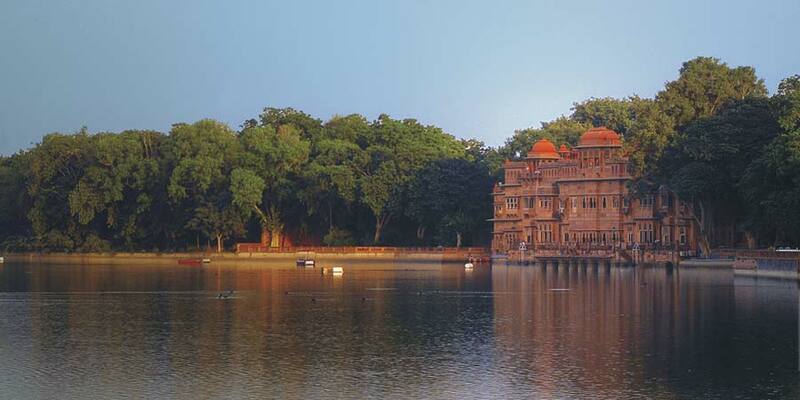 Gajner Palace sprawls over an area of 6000 acres of land and is located at the outskirts of the Bikaner city. The accommdation facilities in the palace offers 45 rooms including 13 historic suites & 31 deluxe rooms. All the rooms and suites are beautifully furnished and some of them offers the panoramic view of the Gajner Lake. The Palace is divided into 4 parts namely : Dungar Niwas, Mandir Chowk, Gulab Niwas and Champa Niwas. It was the place where the Britishers dignitries used to stay. Each suite has been meticulously restored to its original grandeur. The suites of the palace are located at the Dungar Niwas while all the deluxe rooms are located at Gulab Niwas. Services and Amenities : 24 hour In Room Dining, Laundry/ Dry Cleaning /pressing, Car Rental Desk, Currency Exchange Service, Docotr on Call, Non Smoking Rooms, Restaurants. Complimentary Facilities : 2 Bottles of Water, Soap, Shampoo, Shower gel, Toilet Rolls, Dental Kit, Shaving Kit, Tea. Coffee Maker, Newspaper, Hair Dryer, In Room Safe, WiFi, Twice Daily House Keeping, Television. Business Services : Audiovisual Equipments, Computers, Wireless Internet at no Extra charge, Confidential Meeting Suite. Recrerational Facilities : Billiards Room, The panghat spa, Folk Dance, Tennis Court, Nature Walks & Cycling, Camel & Jeep Safari, Table Tennis, Boating at lake. Mrigtrishna Bar : Continuing with the theme of the desert, Mrigtrishna bar evokes similar emotions gentility and elegant opulence as that of Mirage Restaurant. Not surprisingly then, Mrigtrishna translates to ‘mirage’ in English.